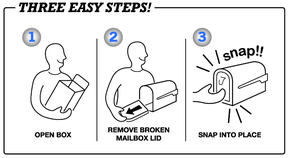 Step 1: Measure the height and width of your current mailbox opening. Step 2: Select the replacement mailbox door size that corresponds to your opening measurements. Step 3: Select the replacement mailbox door color that you'd like.